Finally, be the star of commuter traffic! Make all the kids in the neighbourhood happy! Or just jealous! Engage in inspiring discussions with chemtrail believers! With the wind-driven Bicycle Bubble Machine drawing a dense stream of soap bubbles behind you, you too can bring peace and happiness back to the streets! 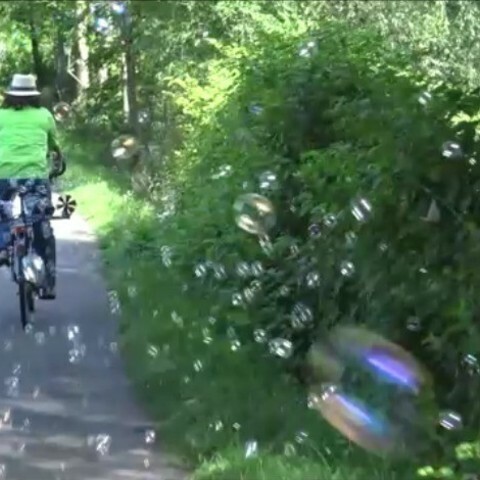 The Bicycle Bubble Machine is a bubble machine attached to the luggage rack of your bike. I actually found bicycle-mounted bubble machines on the net, but they all run on batteries, neglecting the fact that on our bikes we have a source of energy which is much more sustainable and fun: relative wind. The Bicycle Bubble Machine only uses the relative wind created by riding your bicycle: a wind wheel will turn a wheel with bubble wands, which are blown directly by the relative wind. It works surprisingly well at a comfortable range of speeds, and with the funny, jet-engine look the machines have, when one is attached to every side of your bike, it's an eyecatcher. Well, at least it gave me a lot of strange looks when using it on the street. This thing is not difficult to build. I tried to give detailed instructions. Future improvements might be: a lever to temporarily block the bubble wheel, so you can turn off the machine when it is not needed; and modifications to the bubble wheel like combining two bubble rings to a long one for larger bubbles, or improving the topography of the bubble rings to store more fluid. For the pulleys, I used Parametric Pulley by droftarts. I kept them although I dropped using tooth belts (replacing it with elastic ribbon), because they give good friction. 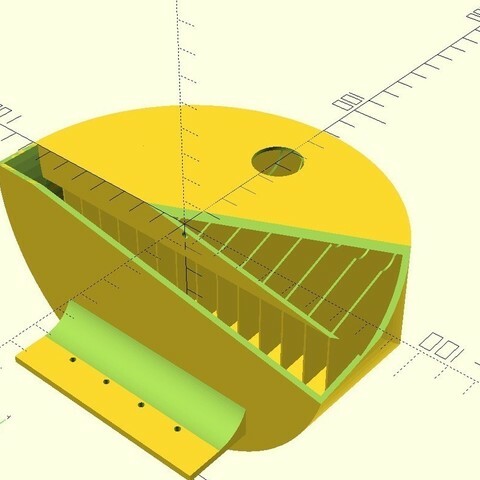 Please take a look at these remixes: http://www.thingiverse.com/thing:976106, http://www.thingiverse.com/thing:973210 and http://www.thingiverse.com/thing:1656828. They definitely make this design better; miroks tank prints easier and without difficult removing of support (his bubble wheel makes more bubbles and might print better on printers with problematic bed adhesion, but for you it might also lead to many connected bubbles which don't fly as good, as someone reported); 3dMODler's remix will help those with friction problems on the pulleys. The third one by jkf123 is a clever idea to reduce spilling even further, by collecting spilled liquid and leading it back to the tank again. Don't be scared by the long instructions. It's easy, I just want to be precise. If there are questions, please ask in the comments. Remove supports; for the support from printbed that it generated inside the tank above the refilling hole you best take a needle-nose plier. Take care to remove as much support as possible from the part of the tank where the wheel will be mounted - it should move freely. Screw the clips to the down side of the wood -- mark their positions using the luggage rack you'll use later and attach them so that you will later first clip on from the side the clips with the opening on the side, then push down the other side of the wood to clip in the others -- see the beginning of the video and you'll understand. Mount the tank on the inside, i.e. nearer to the luggage rack, with the screws. Put one axis into the large pulley, fixing it with a self-tapping screw through the hole in the pulley base. There are holes to do this with "trapped nuts" and corresponding screws, but this really isn't necessary, simple self-tapping screws suffice. Use a 2 to 3mm drill to make the holes right if they're too small. Put the 10mm spacer on the axis. Now push the axis through the first axis hole in the tank. Inside, put the axis through the 6mm spacer or two 3mm spacers, then the wind wheel (with the screw hole on the other side), then through the second hole of the tank. Now, also fix the bubble wheel on the axis with a screw. Check the axis turns easily and both bubble wheel and pulley are fixed, moving with the axis. Mount the wind wheel on the wind wheel mount, putting the small pulley on the back side of the mount, with the pulley base towards the mount. Fix both the wind wheel and the pulley on the axis using self-tapping screws. Now, mount the wind wheel on your piece of wood, with two screws in the long hole on the mount. Don't screw them tight on just jet. Prepare the belt: cut a piece approximately 48cm long and put it around the pulleys so that it loosely fits. Fix it temporarily with a fixing pin or similar. Now test: the belt should be very loose: it has to be just tight enough that the friction will move the other pulley if you turn one (fill fluid into the tank for this test, as it gives resistance), but it must not be so tight that it skews your axis so they don't turn anymore. An even slightly too tight belt will result in no or fewer bubbles. When you're sure you have a reasonable diameter, sew the ends together, remove the fixing pins and cut off any overlapping piece of ribbon. Put the belt over both pulleys. Adjust the wind wheel mount with the long hole so that belt tension is just perfect; then tighten the screws. I placed the whole machine just on the luggage rack like you can see on the photos and the video. You can easily make this more secure with a couple of zip-ties. I plan on adding clips soon so it can easily be attached by clipping it on the luggage rack. Now have fun! Use good bubble fluid, there are great differences in quality.